Lack of school uniforms leads to truancy for some city students. SoGiv has raised enough money so far to purchase 100 school uniforms for city students. Due to economic hardship, some Memphis City Schools students can't afford the required school uniform. And as a result, some students enrolled late into the school year. When students have five or more unexcused absences, they're considered truant. Truant students are penalized by the school system, and some parents are even prosecuted for allowing their child to skip school. Parents can be fined $50 for each day their child is truant, ordered to complete community service, or jailed for up to 30 days. 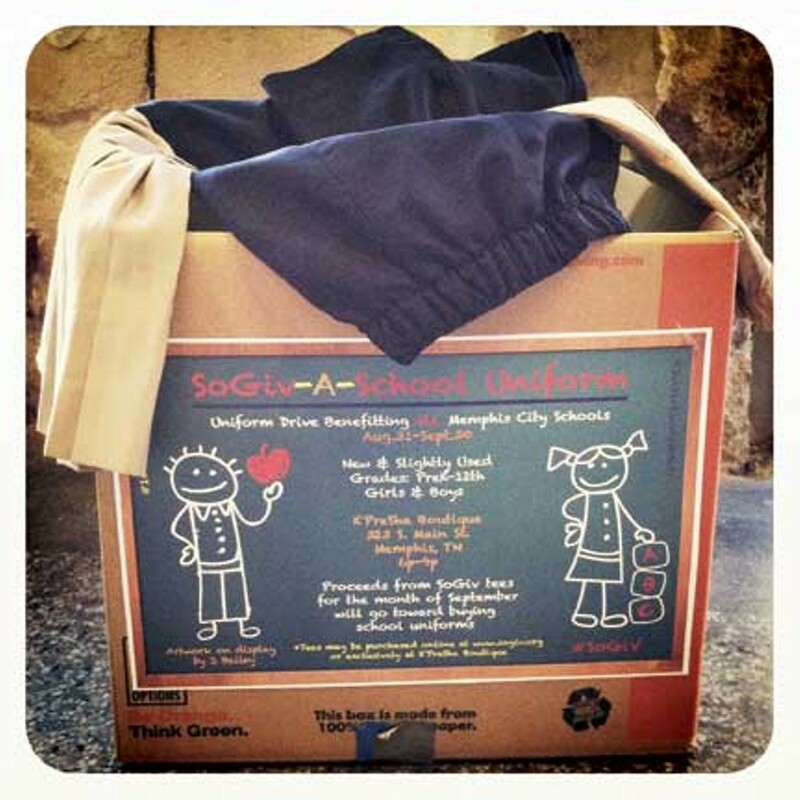 To combat the truancy problem caused by the lack of school uniforms, nonprofit organization SoGiv is holding the SoGiv-A-School Uniform Drive. For the remainder of September, they're selling footwear, apparel, and jewelry with a portion of the proceeds going toward uniforms for low-income students. Shirts can be purchased at sogiv.org or at K'PreSha Boutique at 323 S. Main. SoGiv bracelets can be purchased at Sachë Clothing & Design at 525 S. Main. "If a child wants to learn and go to school, having a school uniform should be the last thing they have to worry about," said Edward Bogard, founder of SoGiv, which holds monthly drives to benefit a variety of charitable causes. "No student's education should be put on pause from the lack of funding by their parents' financial situation." Bogard said about 30 shirts and bracelets have sold thus far, which has provided enough funds to purchase 100 uniforms. The bulk of the uniforms will go to their adopted school, Cherokee Elementary. Nikita Reed, principal of Cherokee Elementary, said more than 30 parents have complained about not being able to purchase uniforms this school year. "Some parents will wait until September or October to register their child," Reed said. "When we ask them the reason why, they say it's because they don't have the money to purchase uniforms. We try to encourage the parents to call the school and inform us, because we have avenues to assist them." Over the last four years, MCS has seen an 80 percent reduction in truancy rates thanks to the district's cooperation with the Shelby County Juvenile Court, the Memphis Police Department, the Shelby County district attorney general, and the Department of Children's Services. If a parent's defense in court for their child's truancy is a lack of funds to purchase a uniform, that would be taken into account when the judge doles out a punishment, said District Attorney Amy Weirich. However, she's yet to personally hear that as a defense. "If that is clearly someone's reason for not getting their child in school, then I'm sure there's an organization out there that will help that parent remedy the situation," Weirich said. "As a parent, you have to take care of your responsibilities. Responsibility number one is making sure that your child gets an education." Ronald Pope, director of student engagement for MCS, works with students who are truant. He said uniforms are just one of many socioeconomic factors that cause kids to miss school. "If a parent doesn't send their child to school because of a uniform, that's just an excuse. Resources are out there to get uniforms," Pope said. "Walmart donates uniforms. Village Mart donates uniforms. If you want a uniform, you can get a uniform."